It has been pretty well established by now that a Democratic candidate can’t win the presidential nomination (much less a general election) without the support of African Americans. Due to that fact, it is interesting to take a look at how Charles Blow is summing up the challenge that faces Bernie Sanders in that regard. Blow interviewed Sanders and then attended his rally at Benedict College in South Carolina. His column about that summarizes both some of his potential as well as missteps. There is an earnest, if snappy, aura to Sanders that is laudable and refreshing. One doesn’t sense the stench of ambition or the revolting unctuousness of incessant calculation. There is an idealistic crusader in the man, possibly to the point of being quixotic, but at least it doesn’t come off as having been corrupted by money or power or the God complex that so often attends those in pursuit of the seat behind the Resolute Desk. 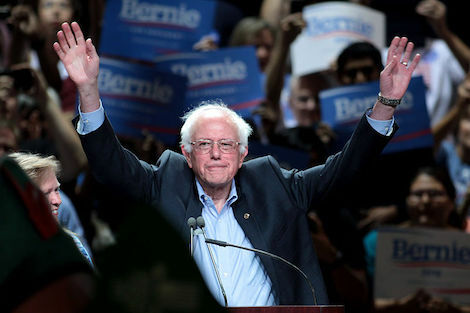 Sanders’s message of revolutionary change to save a flailing middle class and challenge the sprawling influence of what he calls “the billionaire class” has struck a nerve with a fervid following. When it comes to that Sanders message, I was struck by something that Blow tweeted, but left out of his column. In his interview with Blow, Sanders stressed that his campaign recognizes that it is important to “aggressively reach out and bring the African-American community and the Latino community into our campaign.” And yet it appears as though Sanders is making the same mistake a lot of white people do when they realize the importance of garnering support from the African American community…they tweak their own message rather than listen and incorporate what they hear. For example, Blow points out the tone-deafness of assuming that a Black man like Cornell West helps in that regard. But Sanders’s ability to win Obama’s supporters may have been made difficult by his associations. On Saturday, Sanders campaigned with Dr. Cornel West, who recently issued an endorsement of Sanders. West’s critique of the president has been so blistering and unyielding — he has called Obama “counterfeit,” the “black face of the American empire,” a verb-ed neologism of the n-word — that it has bordered on petulance and self-parody. As the United States struggles through its worst economic crisis in generations, gloom has seized much of the heartland. The optimism that came so easily to many Americans as the new century dawned is significantly harder to summon these days. There is, however, a conspicuous exception: African-Americans, long accustomed to frustration in their pursuit of opportunity and respect, are amazingly upbeat, consistently astounding pollsters with their hopefulness. To the extent that optimism has dimmed more recently – it is in response to the shootings of unarmed Black men (often by police officers) and the lack of a “just response” from our justice system. No matter how hard Sanders tries to tie that one to his message about income inequality and economics, it will fall short of connecting to the souls of African Americans. There is a lesson in all that for Democrats: to win the support of people of color, you have to incorporate their concerns…not simply tweak your own agenda and expect them to climb on your bandwagon.